“ I owe you an apology for not writing this story before. You will have to speak to me all over again,’’ I said sheepishly. The face before me hadn’t changed a bit. That wonderful wall-to-wall smile, almost a hearty laugh, slowly took shape. “ No problem,’’ the young climber replied. Occasionally I have missed writing a story despite working on it. Kumar Gaurav’s fell into that category. The first time we met was at Belapur in Navi Mumbai, where he had come to participate in Girivihar’s annual climbing competition. He took time off to speak to me. Then, in the midst of other engagements, my notes stayed just where they were. A journalist’s notes are like skeleton to the body. They offer structure. Flesh and shape – for that, you have to write when the memory is still fresh. I didn’t. To compound matters, middle aged neurons, I suspect, shed detail quickly. It was now exactly a year since that last instance. Kumar Gaurav (Gaurav) was in Badami. Gaurav, 20, among India’s promising young climbers, is from Delhi. He is the third child of four, the others being two sisters and a brother. His mother is a housewife. His father works as a driver. “ Class seven in school….that’s when I got into climbing,’’ Gaurav said. Selections were held at school for the upcoming north zone climbing competition. The boy got selected. At the north zone competition however, he lost in the qualifying round itself. “ Back then, I had no idea what climbing is,’’ he said. Next year, the same story repeated. The year after that, in 2010, he placed third in the north zone competition making him eligible to compete in the national competition. There, he finished eighth in the junior category. Following this he was selected to participate in the training camp for the 2011 Asian Youth Championship. He didn’t make it to the eventual team as he was not adequately experienced in the sport. Gaurav got genuinely interested in climbing. From being someone who had found himself in it, he now wanted to be intentionally in it. It was also the beginning of the young climber’s association with Badami. 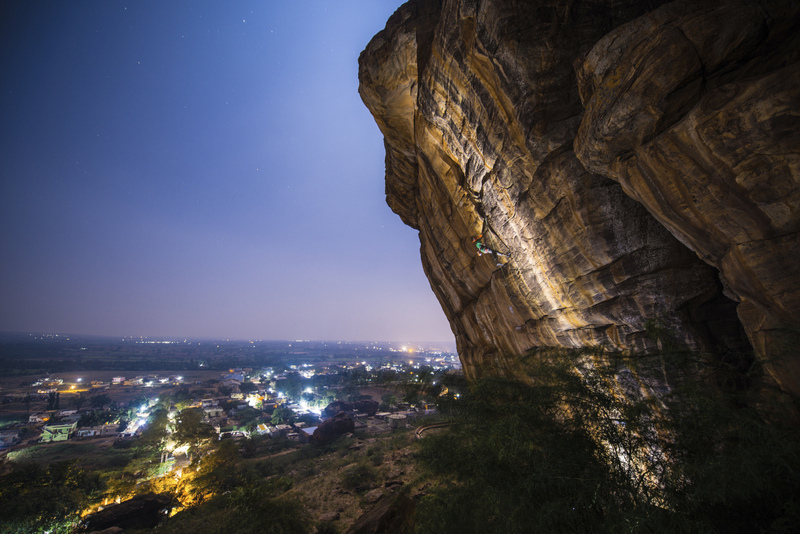 Located in north Karnataka, South India, at a historic junction of ancient kingdoms and cultures, Badami is among India’s hotspots for rock climbing. 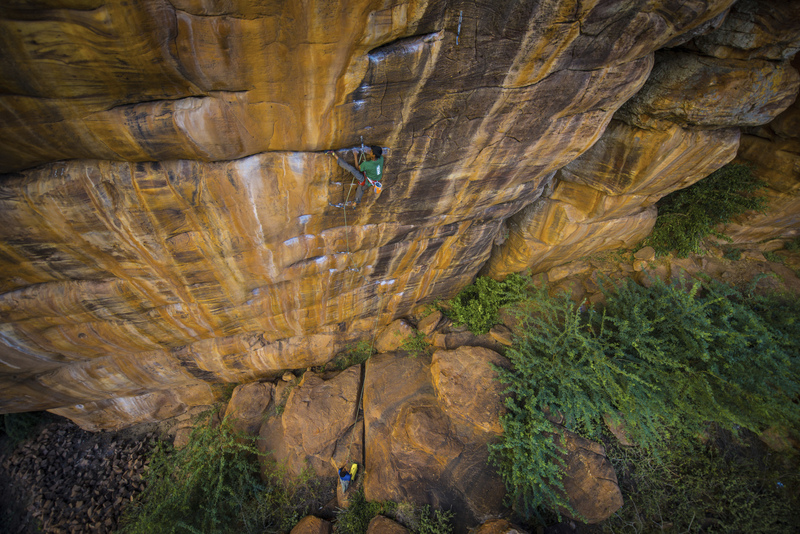 Home to wonderful, beautifully textured sandstone, it hosts some of India’s toughest sport climbing routes. The 2011 training camp organized by the Indian Mountaineering Foundation (IMF) and in which Gaurav had been a participant, was held here. 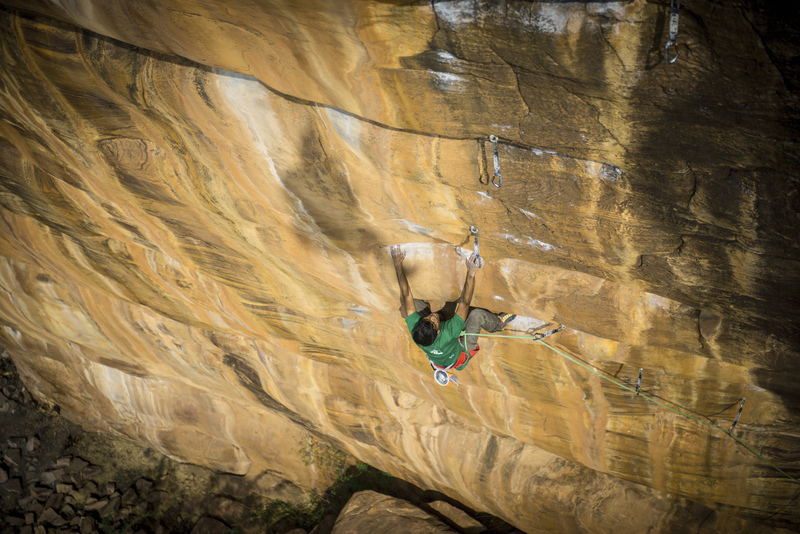 When in 2012, Gaurav wasn’t selected for the training camp he hauled himself to Badami and started climbing on his own with a bunch of local climbers belaying him. The latter were beginners; they had been initiated into the sport by foreign climbers visiting Badami. For young Gaurav, staying at the town’s Vinayaka Lodge (his regular halt right up to 2014) and climbing most days, the partnership worked well. In what seems like a cat and mouse game, he trained out of sight from the official training camp and its participants. 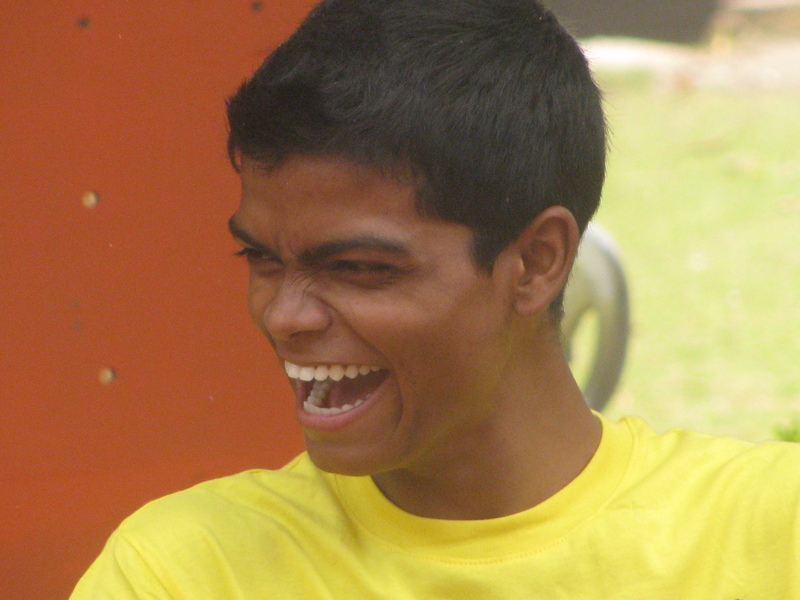 Gaurav climbed early in the morning with full focus on making it to the selection process. Later in Delhi, he got selected for the Asian Youth Championship team on the first day of the trials itself. At the championship, held in Iran, he finished eleventh. Soon thereafter, he participated in the north zone competition, securing first place in lead climbing in the senior category. At the ensuing nationals, he won bronze. “ That boosted my confidence,’’ Gaurav said. By 2013, he started thinking of climbing as a profession. He also decided to pursue climbing outdoors. His visits to Badami increased. “ I prefer Badami to other places for climbing. I think it is the best place in India for the purpose,’’ Gaurav said. His choice was shaped by two technical factors. First, Badami’s rock is sandstone. It is not only great texture for climbing, at Badami, the sandstone is well formed. Second, Gaurav was clear that he wanted to do long sport routes entailing lead-climbing. About 150km from Badami is Hampi, perhaps internationally the best known rock climbing spot in India and as wound up in history and old architecture as Badami. 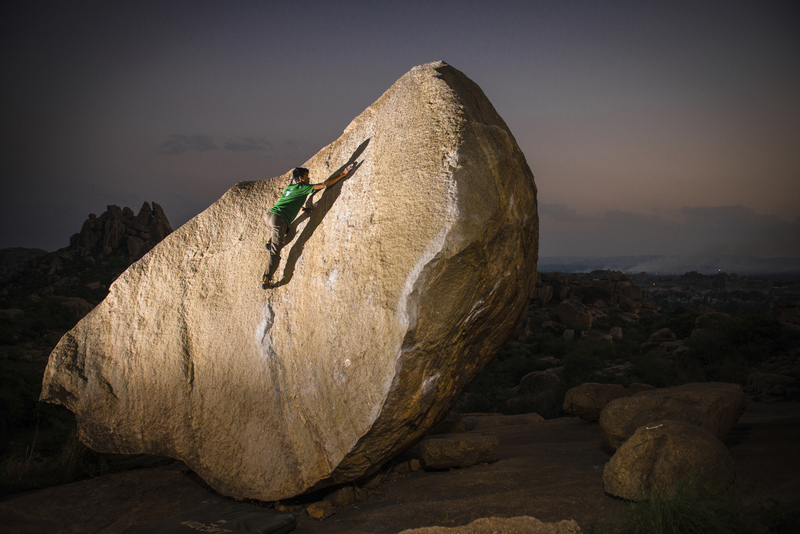 But within the world of climbing, Hampi is identified with the sport of bouldering, wherein individual rocks / boulders usually not exceeding 20-25 feet in height are climbed with minimal equipment (rock shoes, chalk powder and crash pad) and no rope. Gaurav’s game involved longer routes, more equipment and rope. The address for that was firmly Badami. 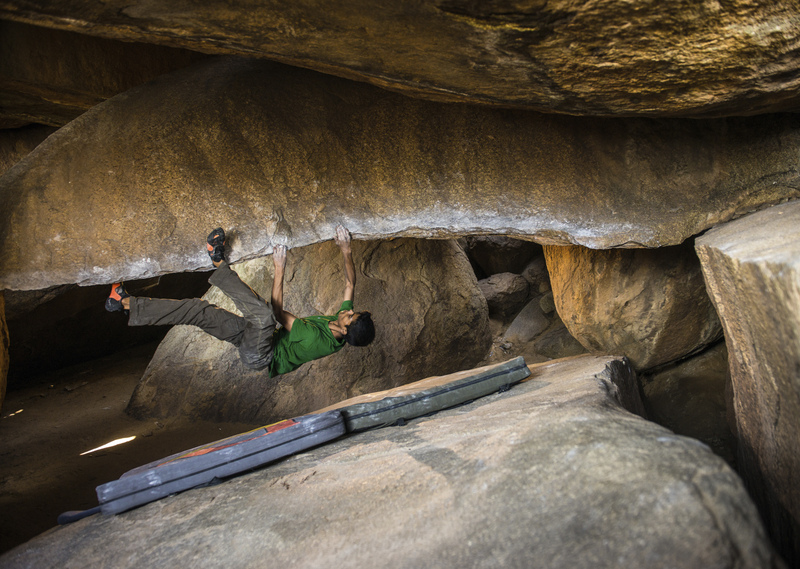 In one year – 2012 – Gaurav visited Badami three to four times, eventually clearing the 7b grade in terms of how challenging or difficult a climbing route is. These climbs were mostly done in the company of local climbers. Gaurav remembered such names as Ganesha, Raj andShivu. At the North Zone competition of 2013, Gaurav finished first in both lead climbing and bouldering. At the nationals, which followed, he was unfortunately laid low by food poisoning. Still he secured sixth place in lead climbing. Between these two events, Gaurav participated in two competitions overseas, a World Cup at Mokpo in South Korea, an open international climbing competition at Haiyang in China and yet another World Cup at Wujiang in China. It was a totally new experience with grades of almost 8a and 8a+ to overcome for qualifying. At Mokpo, he didn’t qualify, at Haiyang he ended last. At Wujiang, Gaurav said, given low participation, all participants sailed straight into the semi final and competition featuring 8b+ route. Gaurav was utterly new to such grades. He finished second last in the semi final. While all this learning was happening in Korea and China, back in Badami, a new chapter had commenced in the town’s rendezvous with climbing. For much of the year, Badami is a hot, dusty town set against a backdrop of magnificent sandstone rock walls. In 2008, at one end of this rock formation, a climbing route was opened by Alex Chabot, a champion climber from France. Eventually named Ganesha, this route was climbed for the first time in 2010 by Gerome Povreau, also of France. Ganesha’s grade was decided as 8b+. It became India’s toughest sport climbing route and a prized challenge for climbers, Indian and foreign. Like climbing, one’s fortunes in life don’t move from one good hold to another. Crimps, slippery slopes and slips lurk in between. Having finished second in the north zone climbing competition of September 2014, Gaurav appeared for the nationals in December. He was disqualified on a technical point. According to Gaurav, the route had clip-in points for the climber’s rope at rather short intervals and he missed one clip-in. By the time he realized the error and tried to correct, his ankle was already above the missed point. That apparently, was sufficient to disqualify him. It seems to have left some bitterness and increased his resolve to focus on climbing outdoors on natural rock. “ Outdoors allows you to have your style. The feeling of freedom is more and there is none to judge,’’ he said. After the nationals, held in Bangalore, Gaurav headed straight to Badami. There he stayed climbing, through New Year and well into January 2015, which was when I met him for the second time. “ So your New Year was in Badami?’’ I asked. “ Climbing is important. New Year comes every year anyways,’’ he said laughing. Climb outdoors on natural rock – to that decision, Gaurav added a wish. He would like to try a 9a route somewhere in the world.